Chila-what?! The beautiful thing about food is you don’t have to correctly pronounce it in order to enjoy it. Eggs and toast for breakfast is fine and dandy BUT chilaquiles and eggs are finer and dandier and totally gluten free. Ole! When making these I grabbed my favorite cast iron skillet, poured in a little oil, and was letting it warm when my four year old came in asking what was for breakfast. One thing I have learned is four year old boys are always hungry. I told him “chilaquiles” and he gave me a crazy look. I told him he could grab me that bag of chips off the island. “Chips for breakfast? !” This dude was sold. Baked egg stratas are great. They are one of my favorite types of breakfasts. My mother-in-law makes a rocking good ham and cheese egg bake that I can’t seem to replicate. But some times we need to add a little spice to the breakfast routine. For my chilaquiles I used canned enchilada sauce. You could easily use salsa or salsa verde if you don’t have enchilada sauce handy. Once you have softened the chips with the sauce you will throw your eggs on top, cover, and cook until the egg whites have become opaque. I knew if I threw a little cheese on top the kiddos would dig in. When making Mexican inspired dishes I love to use Chihuahua cheese it melts perfectly. A few years back I told my daughters, jokingly, that it was made from a chihuahua dog’s milk.  They made a sort of weird face but continued eating it. Now every time we have it I laugh at that memory. Dog’s milk cheese. Can you even imagine? 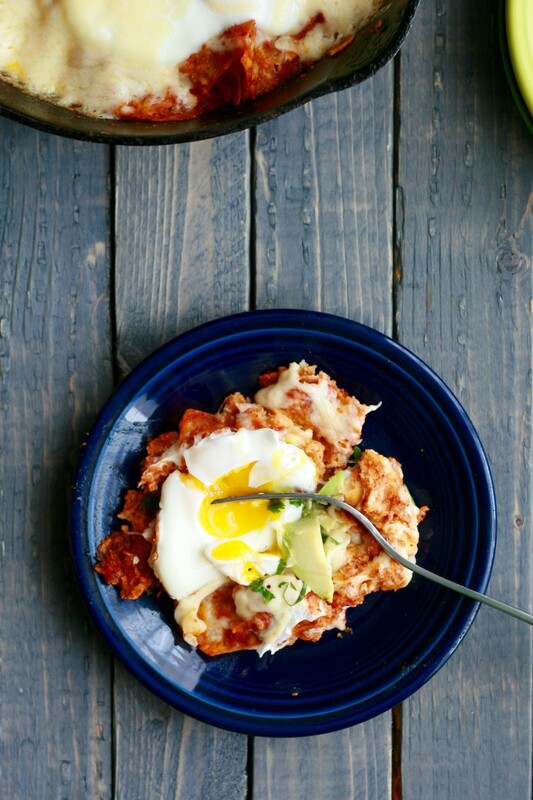 I hope you stuff your face with these chilaquiles this weekend. Weekends were made for brunch and Bloody Mary’s. How do you spice up your breakfast? If using corn tortillas. Cut or tear into smaller pieces until you have 2-3 cups worth. Fry in oil until they begin to crisp (1-2 minutes) add enchilada sauce and follow directions below. Sprinkle with cheese. Cover. Cook additional 2-3 minutes or until cheese has melted. This looks delicious! I need to try this out for Sunday breakfast. It’s like everything I love all in one dish! Chilaquiles are one of my favorite things to get for brunch, but I’ve never thought to make them myself!! I’m pinning this and will hopefully be making this weekend! Thanks for sharing! 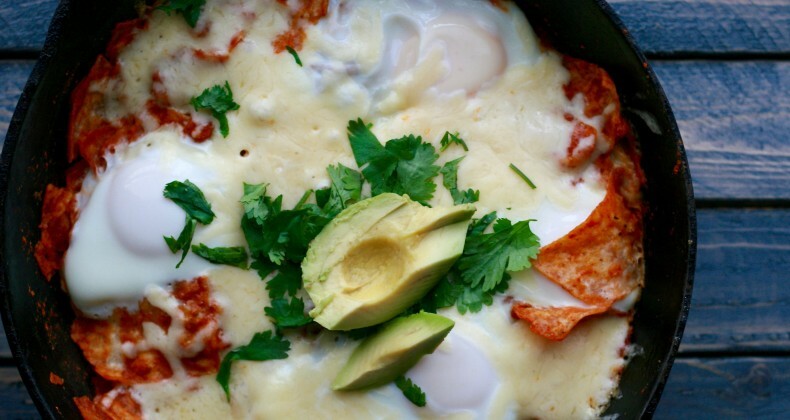 I absolutely am a huge fan of chilaquiles, so when I saw this on Grow Your Blog, I was like I’m TOTALLY checking that recipe out! I absolutely love how easy these are to make! If I would of known this, I would have these bad boys every weekend for breakfast. Haha! Thanks! I also Pinned! Thanks for visiting Samantha! My daughter loves avocado on everything. Wow, such a great recipe! Thank you for sharing! I will have to try it soon!! Thanks Ashleigh –I hope you enjoy it! I giggled reading your first sentence because it’s pretty much exactly what was going through my mind. I am totally in love with your site!! Ha! I am glad someone could relate. Thanks for visiting Chrissa. Great recipe for brunch, lunch or dinner. I”ve made something similar several times and everyone absolutely LOVED them. I love the eggs on top!! So true! Adding shredded meat on top would make a perfect dinner. Sounds delicious! I have all the ingredients in my kitchen right now. I may need to make this for breakfast this weekend. I like the idea of including the kids with the prep to get them on board. “Chips for breakfast” would definitely get my 7 y/o excited too! I have been using my cast iron more…because the more you use it, the better it gets…now I have another excuse to use it!! Yummy! I LOVE my cast iron skillet(s).